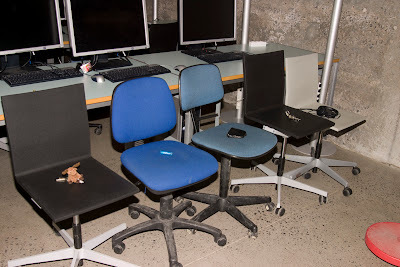 This write up of my workshop last thursday is meant as a tool for my project and might not be that clear to others, but it is an insight into a discourse on the topic of objects with social skills. As promised the workshop started with a "press conference" of evereyday objects my workshop participants usually carry: The Moose Key Ring, "Lypsyl" (Lip Balm), A Wallet, My Keys and Ipod Touch w/headset. Q- Wich sensation do you feel when you are inside the door? A- It is bumpy in the start, but then the world spins around! Q - How important do you feel compared to other devices in your network? A - I Feel almost as important as the camera, but since i am more fun i think she [Ingrid] likes me more! Q - What did you do at 2200 last night? A - I was listening to Prison Break that Alicia was watching, but i was in the dark and could not see. Q - Are you in love with the lipstick? A - We have nevere met, but i've seen pictures. Q - How often do you womit in a day? A - Quite often, at least 5 times a day. My owner stuff me all day long so i have to womit! Investigation - Supervisor, Court of law, Spotlight, FBI, Confidentality, Spy, Hidden, Authority, Secret Society, Interrogate, Information, Undercover, Bluetooth leakage and Documentary. Betrayal - Abuse, Bug, Snitch, Accuse, Revealing, Abduct, Quisling, Robot. This cloud of worrds was then treated with an idea writing session to see if there was anything to pursue. 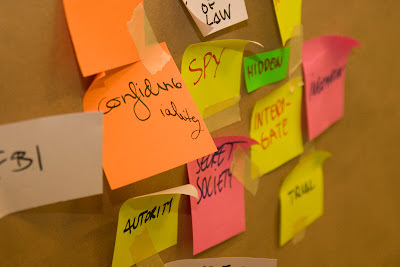 A selection of ideas that would help us reveal their networks. • We should read their magaizines. • We should give them a blast of empathy to make them reveal themselves. • Documentaion of their language (or make it from scratch) and compile it into a dictionary. • By listening in to their gozzip we would reveal their social hierarchy. • Find out if they help each other. • Find out if they have a leader and single out the slaves. • Uncover any economic betrial between objects, does the credit card steal from the phone? • Keep them under surveillance. • Read their holy book. • Track and see their relations. 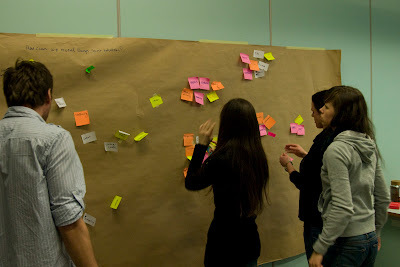 The last part of the workshop was more of a loose discussion with some help from creative methods. The previous excercises had warmed our brains into the right state so the discussion was quite free and several interesting paths were revealed. Do objects have control of their own life? Do they want or need autonomy? What is it with objects that are bought but not used since people are afraid of damaging them? Some objects are more or less used; like the Mac/PC that has become an extension of ourselves. Why does adding lifelike patterns into objects add toy like qualities? Is it because toys usually have imaginary human capacities? What would objects that observe life do? Is that different from having life?